CNC milling is a process that machines parts from solid feedstock either horizontally or vertically. The cutting tool and workpiece move in tandem to complete operations from the simplest to the most complex. Our milling department has 4 CNC milling centers. 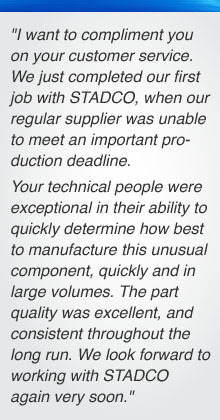 The STADCO process is designed to minimize customer costs for fixturing and hard tooling.